Members of the creative team behind By Wheel and By Wing pose with Jeannie Wechsler (fourth from right), a member of the Parnes family that inspired the show. 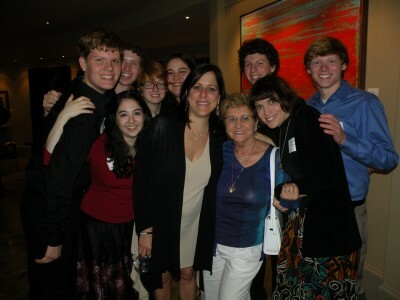 In October 2010, I found myself sitting on a stage with nine other teenagers, waiting for a Holocaust survivor. We were a selected group of teenage lyricists, playwrights and composers from the Atlanta area, and our job was to turn the true story of the Parnes family, a Jewish family of ten in wartime Poland and Russia, into a new, original musical. I had met Holocaust survivors before, usually through my school or synagogue. I respected them tremendously, but they all seemed the same. They were elderly. They had thick accents. Their mouths spoke their stories, but something in their eyes told me that I could never truly comprehend their experiences. Jeannie Wechsler walked in and sat down on the stage with us, and I saw an old woman with an accent. I was ready to be bored out of my mind. IÂ couldn’tÂ have been more wrong. In June 1941, the Parnes family found themselves homeless and on the run in wartime Ukraine. The family had left their hometown of Skalat, on the Polish-UkrainianÂ border, in advance of the German armyâ€™s arrival. The next city over was full of refugees, and the Parneses had no option but to keep moving. They kept moving for 11 years â€“ inadvertently staying one step ahead of the Nazi front throughout the entire war. Jeannie, now 75, was three and the youngest of the Parnes family at beginning of their journey through Europe, Asia and eventually to the United States. When we met her for the first time on that stage, most of our questions for her were related to the basic outline of her familyâ€™s story. Where did you go after leaving Skalat? What was your primary mode of transportation? You were only three years old, how much can you actually remember? With such a large age gap between you, the youngest child, and 18-year-old Moishe, the oldest child, did you ever feel like you had more than two parents? Jeannie transformed into a storyteller. My brother would hold me during the bombings, she told us. He kept me from crying, even as the ground shook and people exploded before my eyes. Jeannie was our most important source of information about the Parnes family story. More importantly, she also became a friend. But at that first meeting, sitting there on the stage, Jeannie apparently felt a similar type of reserve as I did. â€œIf youÂ weren’tÂ as interested, IÂ wouldn’tÂ have opened up,â€ she explained. Jeannie was thrilled by the opportunity to have her story told through musical theater, but she was terrified that we might not be the right ones to tell it. MyÂ co-writersÂ and I showed Jeannie that we were able to tell her story with all the depth and emotion that it deserved, and in turn, Jeannie gave us the most deep and emotionally charged storiesÂ I’veÂ ever heard. My father, Mickey, was such a kind and gentle man. Once, we were starving and he spotted a bird inside the house. He caught it, killed it and cooked it for the children. He had nightmares for the rest of his life. Her father, the gentlest man imaginable, had been forced to take the life of another creature â€“ a previously unthinkable act of violence â€“ because his children were literally starving. Jeannie canâ€™t tell that story without breaking into tears. I realized that I could truly comprehend her experience. It was the first timeÂ I’veÂ connected with a person and her story on such a deep, visceral level, and it was my first experience telling powerful stories that would otherwise never be told. I knew from that moment that I only wanted more. I became a journalist. And for as long as I can, Iâ€™ll keep telling these stories.